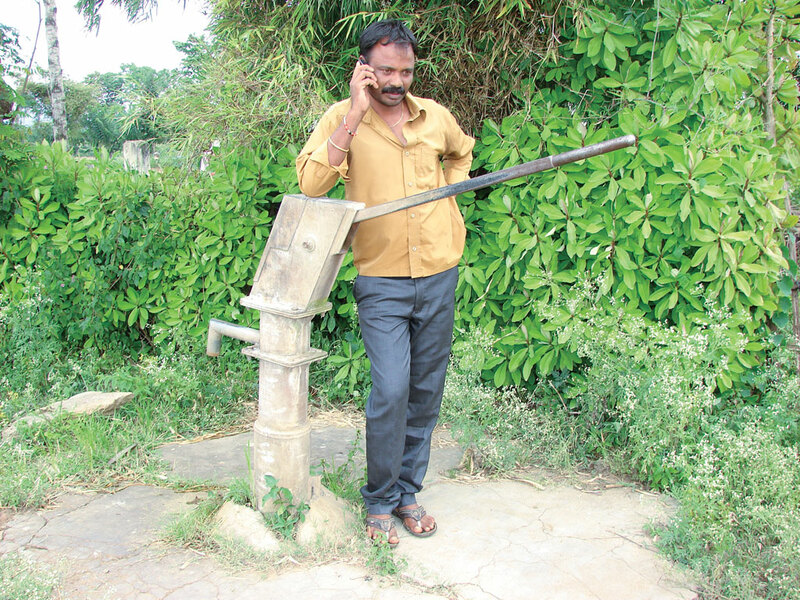 Kalaswamy, 35, a marginal farmer from Antharasan village of Mysuru, is dialing Varun Mitra, a government call centre helpline which issues weather forecasts for panchayats every 15 minutes. The receiver asks him to name his panchayat and district, and then responds, “There is no possibility of rain for the next three days in your panchayat.” The answer makes Kalaswamy a little disappointed, but ends his uncertainty about rain. In absence of proper information last year, Kalaswamy had invested his meager resources in irrigation, and when rains arrived the next day, it destroyed his crops. Thanks to Varun Mitra (friend of rain), this year he is not living in uncertainty. “The paddy crop is the only source of food security for my five member family,” he says. “After this forecast, I will replace half my farm with short duration crops like millet or maize, which need less water and grow quickly,” he adds. Like Kalaswamy, thousands of farmers in Karnataka have tapped into this helpline to know about the weather in their respective panchayats. Karnataka is the only state in India which has developed a mechanism of recording and disseminating weather information right up to the panchayat level, and in real time too, through a 24x7 call centre, which is located in Bengaluru. It provides weather and rainfall updates every 15 minutes. Automatic weather stations are installed at all 747 hoblis (group of panchayats) and rain-gauge meters at 5,625 gram panchayats under a programme called the Weather Monitoring Forecasting and Dissemi-nation System. National weather broadcasts do not provide regional monsoon deficit, so local farmers do not get a warning about the local rainfall scenario. According to the Karnataka State Natural Disaster Monitoring Centre (KSNDMC), 10 out of 33 hoblis are rain deficit. The success of the initiative can be assessed by the record number of phone calls made by farmers since its inception in 2011. By September 2015, more than 388,820 calls were being made annually. “July is the crucial month for cropping, but the state had a rainfall deficit of more than 40 per cent in the last monsoon,” says C Prabhu, executive director of KSNDMC. An impact evaluation of the initiative by Bengaluru-based Institute for Social and Economic Change (ISEC) in 2013 found that 90 per cent of farmers, who had called the centre, had called more than five times, and a majority of them had discussions with the help desk officers about the weather conditions. About 40 per cent farmers used this information to take a decision on when to sow the seeds. And more than 26 per cent farmers used this information to take a decision on irrigation, crop harvesting and threshing timing. “Farmers are now able to save their resources, time, materials and labour, and more importantly, are able to plan their agricultural activities according to the weather updates,” adds Prabhu. “Generally, small and marginal farmers call us on the helpline,” says Srinivas Reddy, director of KSNDMC. The initiative assumes significance as more than two-thirds of the districts in the state have been reeling from a severe drought for the past 15 years. This year too, the state government declared drought in 27 of the 30 districts. What makes the situation worse is that Karnataka has the second largest arid zone in the country, only next to Rajasthan—only 20 per cent of land is cultivable. This forced the state to establish the country’s first Drought Monitoring Cell in 1988. It was renamed KSNDMC in 2007. The programme was funded by the agriculture flagship programme, Rashtriya Krishi Vikas Yojana (RKVY), under which the Karnataka government established the telemetric weather stations. The data is automatically transferred to the server, and subsequently, information is updated every 15 minutes. The forecasts also record wind-speed, humidity, temperature and rainfall. Besides, a daily 24-hour rainfall alert is sent to all panchayat offices, as well as the chief minister’s office, the agricultural department and the disaster management department. “Our forecasts have proved correct in more than 80 per cent of the cases, so farmers have started trusting us,” says Prabhu. As per ISEC’s analysis, most of the callers are from drought-prone areas of north Karnataka, where “dry sowing” due to black soil is widely practised. Farmers sow seeds expecting rains the following week. “So our role becomes vital in suggesting when to sow the seeds or go for dry sowing,” adds Prabhu. Experts say that since RKVY funds are available to other states, they too should adopt Karnataka’s weather forecasting system and help the drought-stricken farmer.